This looks delicious! We have a bunch of plum trees down the street and each year people stop to pick! So nice! That’s great! It’s nice to have unowned fruit trees in the neighborhood. It brings a sense of community when you run across your neighbors gathering a bit for a pie. We have (way too many) blackberries on our street and folks are out plunking them on a daily basis. Thanks for your comment Lyn! Sure! It looks like a nice easy and yummy recipe! So wonderful! I need to make this. Do you think any stone fruit would do for this recipe? I’d love to use up some of our peaches! What a great dessert for this time of year. Looks delicious. Thank you Jovina. :) I thought the same thing…stone fruit is dripping off the trees as I type. What a great year for peaches and plums too! I’m completely enamoured of the temperamental apricot trees and their oversensitive nature. I can relate to those trees! and i’m a tree-hugger. I really am. Please give them a hug from me. I always love a clafoutis. What a beautiful post Seana. Oh Lindy, you just made me laugh out loud! :) I will give those three trees a hug from you and maybe they’ll be full of apricots next year. Just yesterday I had a conversation with a 7 year old boy who told me he had been to a summer camp where they were trying to “talk” to trees. He said it was “stupid” because trees don’t talk. Anyway, always great to hear from you. Hi Seana! I thought about you three different times yesterday, wondering how you were & here you are! One of the thoughts was “what can I do easily with blackberries…Seana would know” Can I substitute them for the apricots? Absolutely! I don’t see why not. This is such an easy little cake to put together and I think the blackberries will look (and taste) fantastic. Clafoutis is traditionally made with cherries, but as much as I love fruit in my cakes and pies I know I would love it here. So great to hear from you! We still haven’t made it to a farmer’s market this season! Let’s do it! Is Columbia City still on Wednesday’s? Count me in. Hi Seana, how lucky to have apricot trees near your home. Beautiful dessert….. I grew up with a massive apricot in the backyard. We had so many that my mum would lug a big box to the local fruit store and swap it for a box of apples! Isn’t it wonderful to “stumble” across something. I live in the inner city and there are so many little community garden “patches” tucked away in the most unlikely places on verges, nature strips and at the end of cul de sacs, all with a little sign to help yourself. I’ve lost count of the times I have wandered down the street mid recipe with scissors in hand to snip much needed herbs. Love the apricots. What a wonderful find. What a great story Tanja! I love that you are able to help yourself to herbs “as needed”. And the little garden patches are lovely. We call them P-Patches here in Seattle, but I haven’t seen any help yourself signs. I think that is a wonderful sharing gesture. It certainly lifts community spirit and is a real conversation starter when passers by realise that it’s there to share. This looks like such a wonderful dessert! And how nice that you have apricot trees nearby! This is my favorite type of dessert. Not too sweet, with a little fruit. It really is nice to have the apricot trees down the street, however, it would be even better if they produced fruit every year! :) Thanks Nancy! 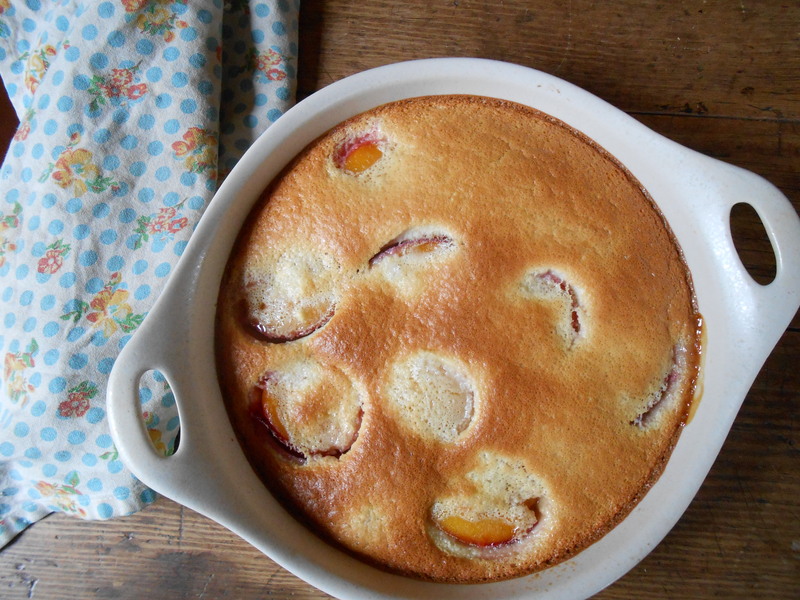 How I long for the stone fruit season, just to eat the fresh juicy fruit, but then i think I’d have to try clafoutis with apricots too, I can imagine how good it tasted. Those are my trees! I will fine you one large slice. What a delicious-looking dessert! I love fruity desserts as well, and would love to try this! Thank you for the inspiration! Saving it! I bet I can make it with some nectarines or peaches?? Clafoutis is kinda cake, right?? This is outstanding! I think I could even bake this! For some reason I think you are saying that you don’t consider yourself a baker?? :) Well, honestly…neither am I! So, yes, if I can make this…you can bake this! :) It’s so easy. All the ingredients are blended in a blender and poured over the fruit, then baked. Voila! Indeed, this is the season for clafouts. Ripe fruits in season covers with delicious semi-custard cake. Yum! Agree. Can’t think of a better dessert this time of year. I am about to put a clafoutis together with peaches. Delicious. Oh how I wish we had apricots here. All we can find are those overly astringent ones that turn up from god knows where long after picking in the grocery store. But isn’t clafoutis the best dessert for good fruit? So easy and so delicious. I’m familiar with those astringent apricots. Might as well eat cardboard! I’d trade some of these apricots for some of your Kentucky corn! Seana, it is great that you are a “caretaker” of those trees, of sorts. What a beautiful recipe for a fruit that would have gone by the wayside. Seana– luscious recipe! Love fruity, crazy desserts in the summer. We have a uncooperative apricot tree Larry planted for my birthday in our backyard. To make this, I’m going to have to trot off to the market and find some apricots. thanks!! That is sad. It’s very bothersome to have to cut down a tree, especially if it’s a fruit tree. I improperly planted a nectarine tree a few years ago and lost it and that really bothered me! Best wishes to you as well Emma! I just don’t get it when people doesn’t take advantage of the wonderful fresh produce that they have available to them! This Apricot Clafoutis looks delicious and it is such a beautiful dish. True. I anticipate fresh seasonal produce every year. Can’t wait to try your skillet pie! love your classic dessert -looks perfect for winter. Thank you so much. :) I agree…winter would be a perfect time to whip up a clafoutis…or two. 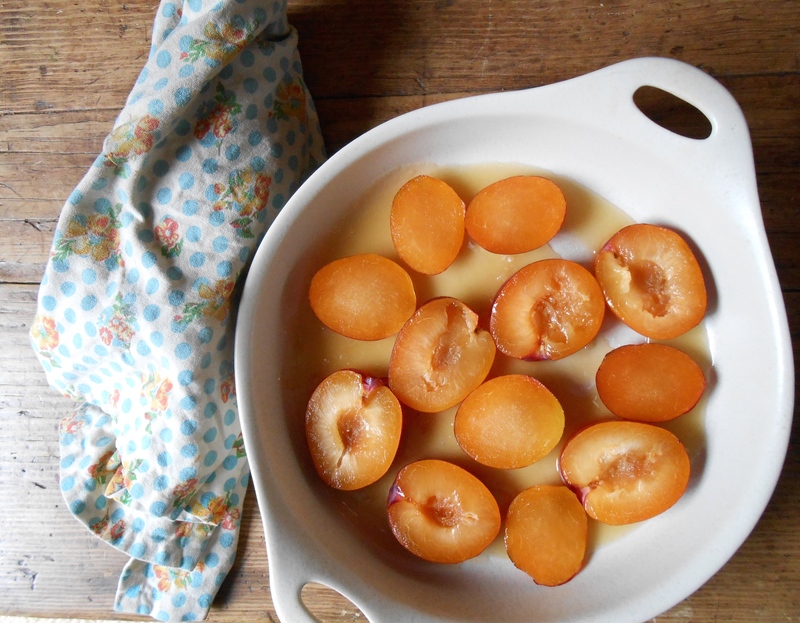 Cherries and apricots are both in season together, and combine nicely in many desserts I use half almond flour and half all-purpose flour in this clafoutis Serve it warm or at room temperature, and eat leftovers for breakfast. You are currently reading apricot clafoutis at COTTAGE GROVE HOUSE.